Ajao is a design inspired by a neighborhood in Lagos, Nigeria where I was lucky enough to spend a month. The colorwork pays homage to the multitude of different window shutters and jumble of metal grilles all stacked on top of each other that I encountered on my daily walk to the bus stop. The metal of these shutters was glistening mirage-like in the iridescent, hazy light of the West African sky, and the strong contrast of the colors in this sock pattern seeks to captivate this intangible memory. 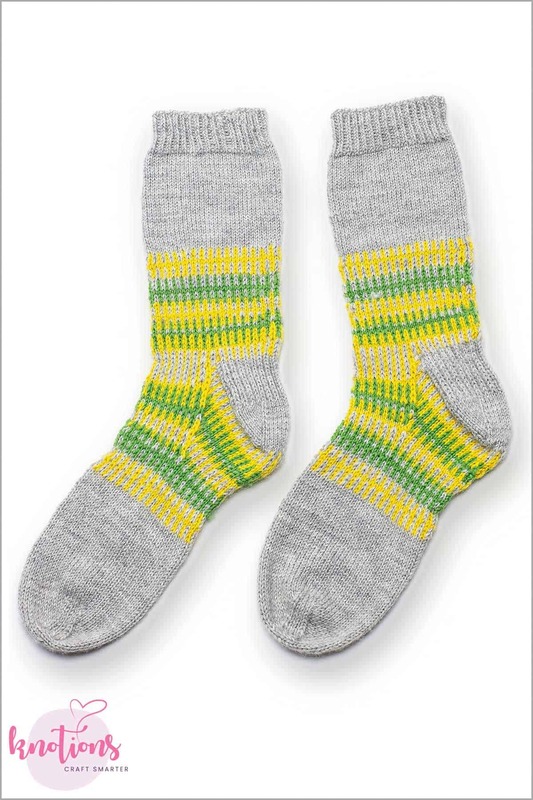 These socks are knit top-down with a twisted rib cuff and a traditional slip-stitch heel flap and gusset. 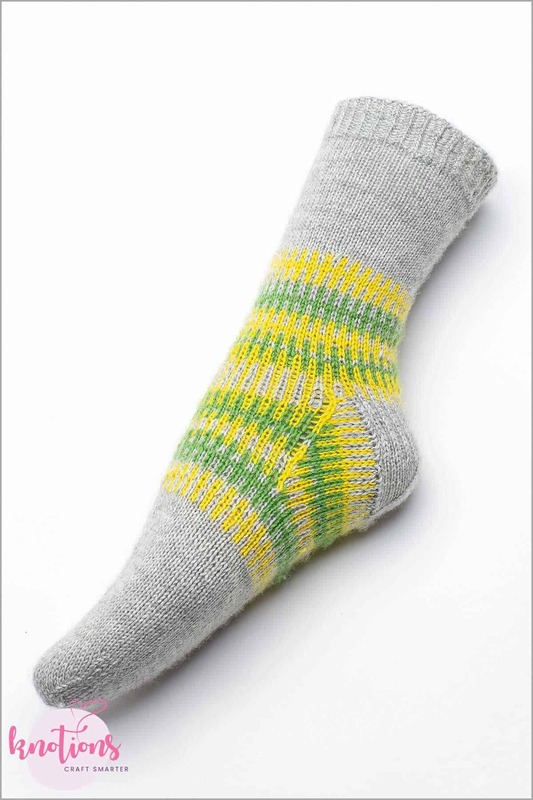 The design features easy colorwork in the middle section. Using only about 60 yds of each contrast color and 220 yds of the main color, this pattern is also ideal to use up scrap yarn. 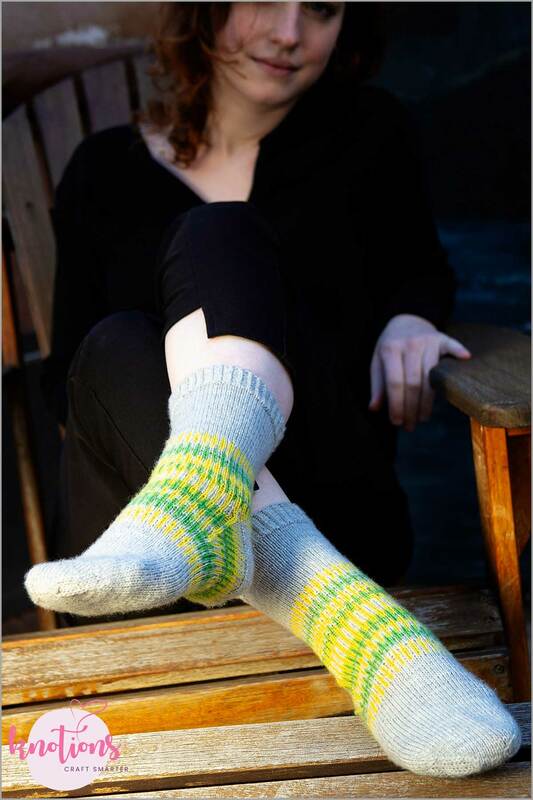 Thanks to Ellen for knitting the pictured socks! Women’s small (medium, large), to fit 8 (9, 10)” [19 (21, 23) cm] ankle circumference and shoe size 6 (8, 10), approx. 10% negative ease. Knit Picks Stroll Sock (75% Fine Superwash Merino Wool, 25% Nylon; 231 yards/50 grams): MC: 1 skein Dove Heather, CC1: 1 skein Peapod, CC2: 1 skein Dandelion. 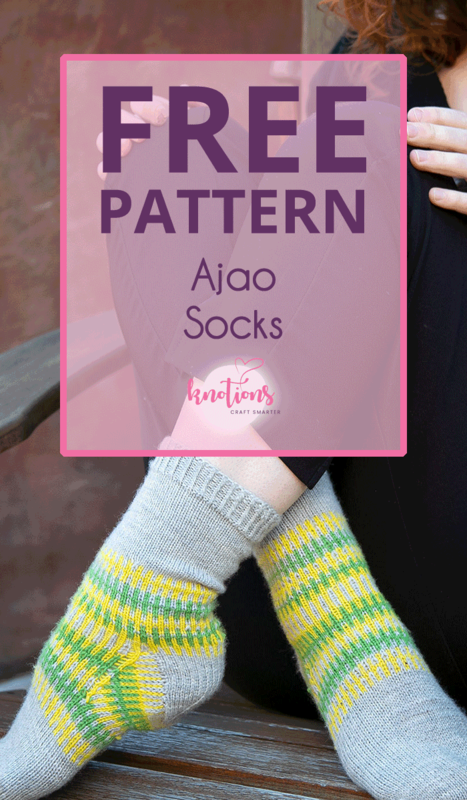 Thanks to Knit Picks for providing the yarn for our Ajao Socks! US 1.5 [2.5 mm], or needle size required to obtain gauge. I find DPNs easiest for this pattern but circulars/magic loop technique work too. 32 sts and 44 rnds = 4 inches [10 cm] over St st in the rnd. Twisted Rib: *ktbl1, p1, rep from * to end. 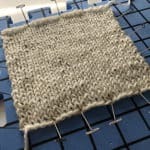 Minimizing a jog when starting a new rnd: stitches marked with X on the chart can be slipped instead of knitted to minimize a jog when changing color. The jog can be evened out further through blocking. CO 56 (62, 68) sts and begin working in the rnd using magic loop method (or preferred method of small diameter knitting). Work cuff in 1:1 twisted rib for 15 rnds. Work in St st for 20 rnds or to desired length of leg. Work colorwork chart, Part 1 to end (Rnd 29). The heel flap is worked back and forth just on the heel sts. To work the heel flap, cut the working yarn and center the heel flap around the old BOR as follows: slip 13 (15, 16) sts before the BOR and 14 (16, 17) sts after the BOR onto one needle–27 (31, 33) heel sts. 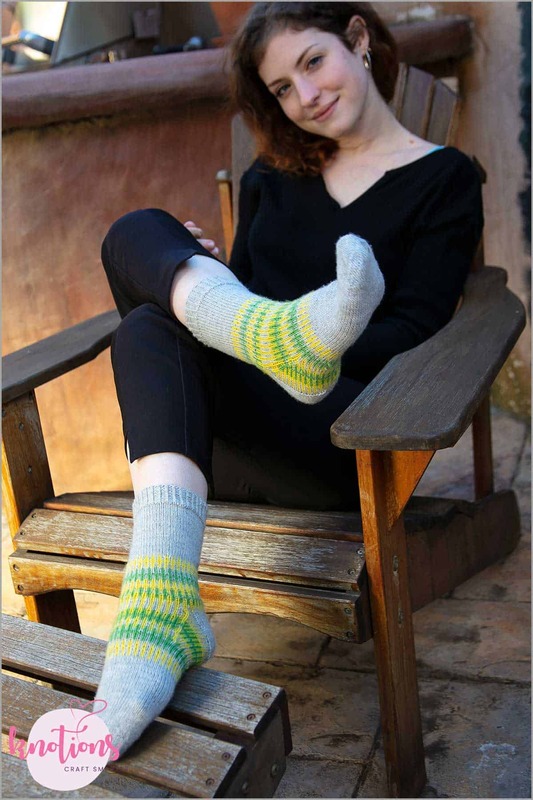 The remaining sts will not be worked during the heel flap or heel turn. 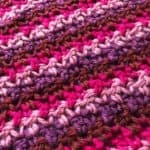 In order to keep the color work pattern symmetrical make sure that both edge stitches of the flap are in the main color. 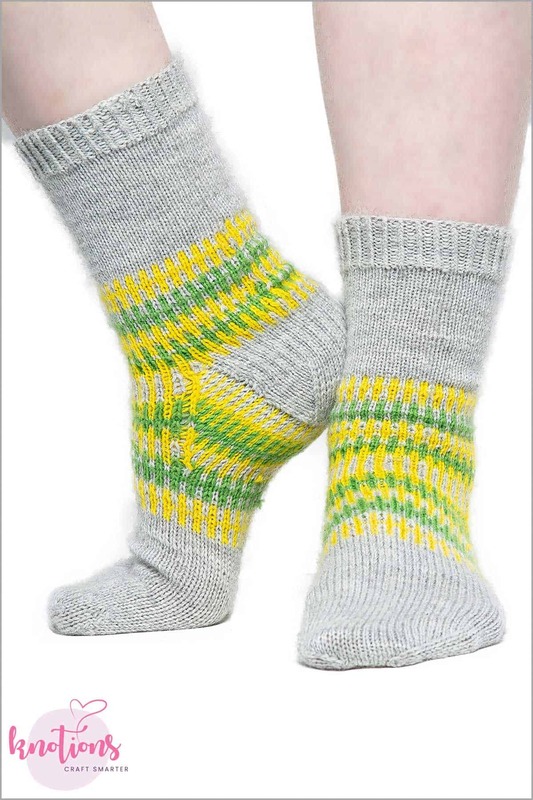 For sizes S and L, this means that there will be one less stitch on the heel needles than on the instep needles. Row 1 (RS): *Sl 1 pwise, k1, rep from * to end. Row 2 (WS): Sl 1 plwise, p to end. Repeat Rows 1 and 2 until 24 (28, 30) rows are complete. 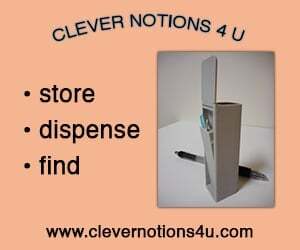 Note: Sl 1= sl1 pwise. Always slip the first st of each row and knit the last st.
Row 1 (RS): Sl1, k8, k2tog, k5 (9,11), ssk, k9, turn. Row 2 and all WS rows: Sl1, p until 1 st left, k1, turn. Row 3: Sl1, k7, k2tog, k5 (9,11), ssk, k8, turn. Continue heel turn as established: rep Rows 2 and 3 7 more times, working 1 st less before the k2tog and after the ssk in each Row 3. [9 (13,15) sts rem]. Cut the yarn and start the new rnd in the middle of the heel turn, splitting heel sts as follows: 4 (6,7) on the left needle, 5 (7,8) on the right needle. This way the start of the new rnd and the jog when changing color is hidden under the sole of the foot. Pick up stitches according to Rnd 30 of the chart, alternating MC and CC1. Start with MC for size S and M and with CC1 for size L.
Rnd 1: K4 (6, 7) heel sts, pu 21 (23,24) sts along the left side of the heel, work across 29 (31, 35) instep sts, pu 21 (23,24) sts along the right side of the heel, k to end of rnd. Rnd 2: Work in pattern to 1 st before instep, k2tog, work to 1 st before end of instep, ssk, work to end. Rep Rnds 1 and 2 until there are 56 (62, 68) sts rem. [22 (26, 28) more rnds]. Work even for remaining rnds of the colorwork chart. 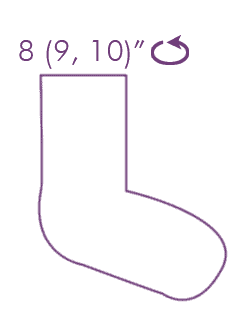 Knit 16 (25, 32) rnds in MC or until the foot measures 1.5’’ [4cm] less than the desired length. Before starting the toe shaping, move one stitch back onto the sole needles in size S and L to even out stitch count for toe decrease. K1, ssk, work to last 3 sole sts, k2tog, k2, ssk, work to last 3 sts, k2tog, k1. Rnd 2 (plain rnd): Work even. Repeat Rnds 1 and 2 until 36 (42, 48) total sts rem. Move sts onto two needles, instep sts on one, sole sts on other. Holding N1 and N2 together, graft sts using Kitchener Stitch. 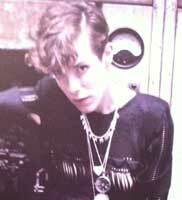 I am a London based fashion and knitwear designer. Craft infuses every aspect of my life and I was one of the last generation of lucky kids to learn knitting in primary school back home in Switzerland. After years of working in the fashion industry I have recently decided to return to my real passion and focus on developing patterns for hand knitting in line with a more gentle approach to fashion, making and dealing with material resources. 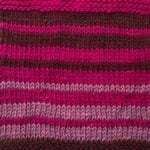 As a knitter, designer and researcher, I love to immerse myself in technical conundrums and enjoy unusual garment constructions, which are only possible in hand knitting.